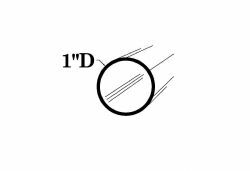 1" OD with a .050" wall round tube. Available in a satin and black anodized finish in 24 ft., 12 ft., 8 ft., 6 ft. and 4 ft. lengths. See above document link to display all round tubes and pipe in a Table View.